At the end of a long week, a romantic night out can feel like just the thing you need. Maybe it’s your one night away from the kids, or your opportunity to relax and spend some quality time together. Whatever your motivation for date night, while it’s no doubt a habit you should practice, it can often times cost you more than you’d like. Between fancy dinners and the rising cost of movie and concert tickets, an attempt at a special night can hinder your budget before you know it. While it’s fun to treat yourself to those events every now and then, there are ways to still enjoy a romantic night out and stay on budget. So, the next time date night rolls around, consider trying one of these nine ideas that are sure to provide a wonderful time without breaking the bank. There’s nothing quite as romantic as gazing up at a sky bright, full of stars; it’s also completely free. Make a night out of stargazing by bringing along a blanket, a bottle of wine (or something warm if you’d prefer), open the SkyView app, and discover new constellations and stars together. Whether it’s breezy spring, balmy summer, or crisp fall, there’s nothing quite as cozying up together in the secluded outdoors. Learning something new together is a great bonding activity. A dance class is a fun way to spend time together and learn some killer new moves. While the price tag might seem it a little high upon first glance, most studios run package deals that when broken down equal a couple on-budget date night. For example, you’ll often find a set of three classes for $75. Moreover, you can likely find a ballroom or dance club where you can learn a new dance or try out your moves for even cheaper. Chocolate dipped anything tends to be on the romantic side, but if you or your significant other is more of a cheese lover, than this works for that too. While you can get a fondue set, as long as you have a sauce pan or crockpot and some skewers, you’re good to go. Grab some melting chocolate, Swiss cheese, cut up some crudités and strawberries, and have a candlelit, romantic dinner experience together. A night out to the movies is a great go-to date night. Unfortunately, movie tickets and snacks seem to just get more expensive every time you go. Instead of shelling out a hefty amount of cash at the theater, have a move marathon in your own home. Grab a few Redbox selections or opt for a new pick on Hulu for next to nothing. And although movie popcorn is great, popping your own at home, while picking up a few candy selections, is also significantly more inexpensive. The best part? You don’t have to worry about making it to the theater by a certain time or worry about missing any of the good parts during bathroom breaks; the comfort of your own home also equates to your own timeline. Listening to your favorite band together is no doubt an exciting date night. Of course, depending on who you’re going to see, tickets can run into the hundreds. Instead, opt for your local concert venues or theaters in the park and discover new and upcoming artists. You’ll still have a wonderful time, but won’t break your budget to do so. Moreover, you never know what great new bands or songs you could stumble upon. Lots of local bars and venues have begun to host trivia nights and often theme them around a certain decade or pop culture favorite. Whether you’d like to go with just the two of you or go for a group date, trivia nights are often free, unless you choose to have a drink and some appetizers, and are a fun night out that’s sure to test your knowledge. Sometimes in the chaos of the everyday, we forget to stop and enjoy the scenery around us. Depending on the weather of course, taking the time to enjoy your town and the scenery around you can be a great date night. Find a great path around your city and enjoy the outdoors; it’s free and will give you plenty of time to have great conversation with one another. Nothing makes you feel quite as good as helping others and doing so together not only doubles your impact, but can make you appreciate each other even more. Find an organization or volunteer activity that you both enjoy for date night. You’ll get out for the evening or day and feel good about your night because you helped someone else. After the early stages of your relationship, coffee dates tend to fall to the wayside. That being said, in most cases, coffee tends to be a lot cheaper than drinks. Whether you have a favorite coffee shop or want to try a new favorite, coffee shops are usually cosy and an ideal place to chat. Moreover, many coffee shops host live, local entertainment during the evenings and weekends, so you might also be able to catch a free show. And, if you can handle more than one cup per day, you could make the evening a little more interesting by hopping around to different ones. Getting in the habit of having a regular date night can be a terrific way to keep your relationship fresh and exciting. Unfortunately, thanks to the constant rise of the cost of living, date night can cost you more each week than you can afford or should spend. 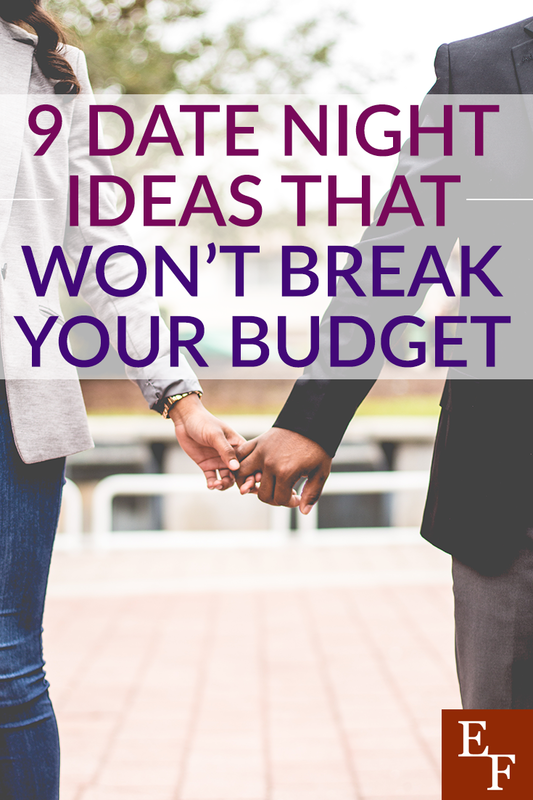 Date night doesn’t have to cost a fortune, instead of spending too much for a night out, consider these nine on-budget date night ideas. After all, date night is truly about spending time together, right? What are some places in your town that have fun and inexpensive or free activities? How often do you have date night?